Hi everyone! I hope you’re having a great Tuesday. I am now back from South Carolina & had an amazing time with my family. I will be posting a recap on the weekend tomorrow, but for today I wanted to share with you a story of strength & inspiration. Unfortunately this world lost a beautiful girl last week. One of my best friends, Sarah, let me know over the weekend that one of her best friends, Jessie, suddenly passed away last Thursday. I’ve hung out with Jessie multiple times & she was truly one of a kind. Her sparky personality is something no one will forget & her sense of humor could make anybody smile. After finding out this news, Sarah turned this tragic event into motivation to make Jessie proud as she ran a 10miler on Sunday in her honor. I was not surprised at all when I received a text from Sarah shortly after the race to let me know that she finished it in 65 minutes! Sarah & Jessie have been friends since they were young & as they grew up, they started training together for running events. These girls constantly inspire me to work hard & keep a positive attitude, and they never cease to amaze me with their abilities. Jessie will be missed & I ask that you take some time today to please send a positive thought & prayer out to Jessie’s family & friends. In times like this, it really makes you realize how short life can be. We really need to live each day to the fullest, just as Jessie and my late friend Kyle did as well. You may remember that I recently announced that I will be running a half marathon next May in honor of my friend Kyle, & I know others will be running in honor of Jessie, as will I. These ladies have inspired me to work hard & enjoy the process. I am new to the whole running scene & have recently started incorporating more runs into my week along with some other types of training. If you didn’t know, November is Marathon Month! If you’re like me, & maybe new to the running scene, or even a vet, tonight Under Armour Women & FitFluential are teaming up for a twitter chat all about Marathon Training. Many of you have already signed up for races and are hitting the pavement hard. But Under Armour wants to help everyone to get in top racing form. Join us tonight at 9pm EST with the Hashtag #IWILL to chat about marathon training and cold weather running. 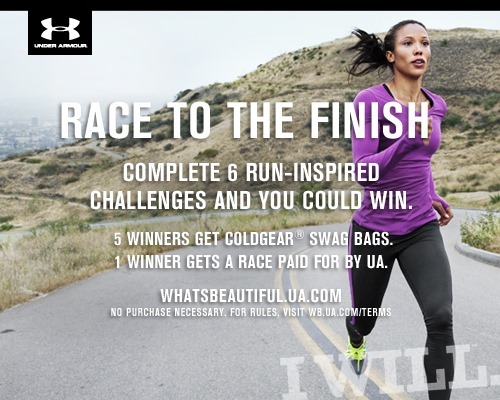 Two lucky chat participants will WIN an Under Armour race swag bag! Two winners will be randomly chosen to receive an Under Armour run swag bag. US only, please. You’ll also be introduced to Under Armour’s ColdGear Infrared line. Inspired by military airplanes that are coated in a powdered ceramic which absorbs infrared light (a kind of heat), ColdGear Infrared makes you warm and keeps you warm, without any added weight or bulk. As well as the twitter chat, you can also complete the 6 racing-inspired challenges at WHATSBEAUTIFUL.UA.COM by the end of the month and 5 winners will be selected to receive a ColdGear® Racing Swag Bag. One lucky winner will also have her next race registration paid for by Under Armour®! 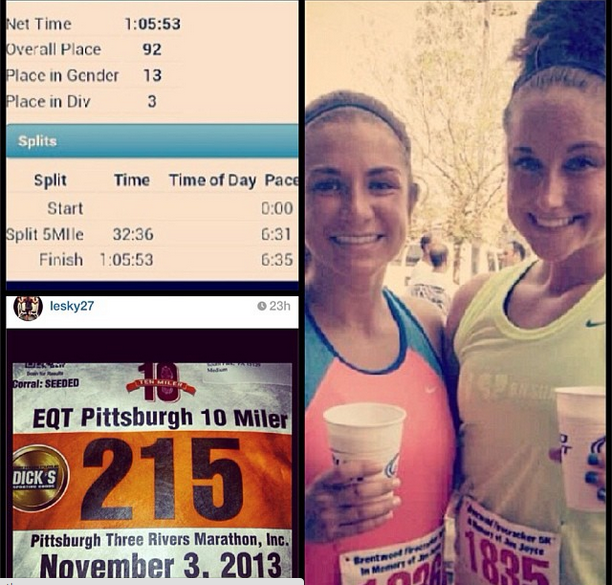 If you’re honoring a friend with running a race or making it a personal goal, feel free to join in! You never know what you’ll be inspired to do. My prayers & thoughts are with Jessie & Kyle’s family & friends as we all remember & honor them. Do you have any races coming up that you are training for? Monday Shoulder Circuit & Single Serve #DailyHiit Blueberry Oat Cookies! Thoughts and prayers to you, your friends and Jessie’s friends and family. It’s never easy losing someone, and it does tend to put things into perspective. I love that Sarah channeled that loss into an incredible run, I’m sure it was more than emotional and powerful. I am currently training for California International marathon, it will be my 7th. After finishing #6 in early October and knowing I could push myself more, and also finding out a few days later I lost a very close friend of the family– I signed up for CIM. Life is short, take chances, don’t wait for ‘next time’ because you don’t know if there will be a next time. So in that case- this means flying across the country to run a marathon to push myself and to honor the loss of someone special. Training for the Disney marathon in January! !